Perfect your look with the finishing brushes by Real Techniques. 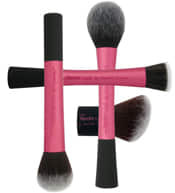 4 full sized brushes that will set your make-up for a stunning finish. These brushes are designed to be simple and easy to use, without compromising on quality. They are cruelty free and guaranteed to revolutionise your make up application.